I hope your day is going well. 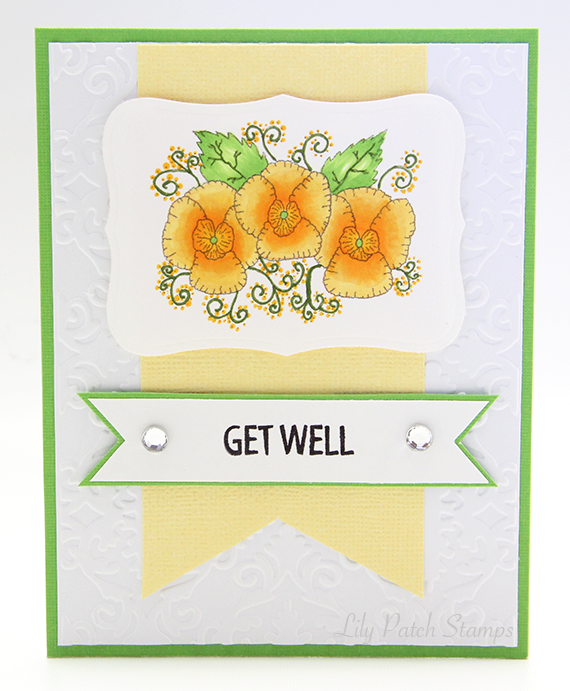 This card is for today's Tuesday Throwdown challenge using CraftyGirl Creations beautiful Pansies image. I searched for photos of the actual flower to recreate the colors in this stamp. There were some really pretty color combinations but I decided to go with the monochromatic yellow. Yellow is a cheery color so it was fitting for a get well. card. I embossed the white background and did some die cutting for the image. The image and sentiment are placed on the card using 3D tape. I added some rhinestones to the banner to give it some bling. Please join us over at the TT blog for more DT inspirations and enter to win a fun prize package from our sponsor. Pretty card. Thanks for joining us at Eureka Stamps this week. Sweet get well card. Nice layers, great for our challenge at Eureka stamp: Pile it on!. Thank you for joining us and good luck. Lovely card! Great colours, giving a promise of spring! Thank you for playing at Eureka Stamps this week! Oh Kim... these pansies are so sweet!